Whether seashore or woodland, prairie or mountain, desert or tundra – every person-ality of the land demanded competent survival skills of the first people to settle in it. Each discrete landform required its own specialized lore, because humans had to meet their needs not with resources they wished they had, but by using what was available. To one man, the building block of his home was snow or ice. To another it was grass or mud or animal skins. Some utilized logs. Others used sticks. Here in the forests of these Southern highlands, caves were certainly appropriated for shelter, but of course caves could not be moved to the most favorable settings. (One etymological interpretation of the word “Cherokee” describes people from caves.) New tenants of the land simply took what they could find. But when early inhabitants of southern Appalachia began to look at choicer locations (and less dank living quarters), their first homes were comprised of sticks and mud and leaves (a wattle and daub hut with a thatched grass roof). These building materials were found in abundance. space needed to perform a variety of chores. Now there was room to store water in the home, because free time had opened up for the making of vessels composed of clay dug from creek banks. This addition of crockery eliminated the constant going to and coming from a stream. In other words, a resource (water) had been harnessed, so to speak, by bringing it inside … within easy reach. It was only natural that humans would strive to invent less demanding solutions to their basic problems. We all do that even today. In fact, one way to look at the history of humans is to follow the “evolution of comfort.” Within this story of water, anthropo-logists consider it an important chapter when humans stopped lowering their faces to a stream and learned to cup water in their hands and raise it to their mouths – a posture better suited to staying alert and alive (to see what predator might be approaching). Consider where we are now in the story: channeling water through the walls of our homes by way of pipes and then again out of our homes once we have made use of the water. What yet-to-be-discovered technique might the future hold for making water available inside our homes? Here’s what the primitive approach would require: build a fire of dead hardwood and let the wood burn down to coals; burn out a concavity in a chunk of wood by using hot coals and a blow-tube (a hollow plant stem like Joe Pye Weed or rivercane) to superheat the coal; scrape the depression with stone and sand to produce a finished wooden bowl; fill the bowl with water from a stream; heat egg-sized stones on the bed of hot coals; at intervals, drop glowing-red stones into the bowl of water to bring it to a boil and keep it there for fifteen to twenty minutes to purify the water. 1.) It’s a different world now because of the escalation of terrorism. There are people in other countries who feel that America is long overdue on being at the receiving end of foreign attack and devastation. (Even Pearl Harbor seems not to count, because of its distance from our consolidated shores.) We, who engineered the horrors of Hiroshima and Nagasaki and head the list of the planet’s voracious consumers, present an image to many that is spoiled and arrogant. From the lessons of September 11, 2001, we have a new awareness that – within the scope of terrorism – anything is possible. Almost certainly there is more tragedy to come. ware you would ever need for collecting and boiling water. be forced to venture outside for our food. Hunting and fishing would enjoy the status it once held in pioneer days. Those good at it would be renowned. But the forests and streams would be overwhelmed by sheer numbers of people trying their hands at it. The forest would likely become a war zone of territorialism and desperation. As for our other needs, virtually all of us possess at this moment a lifetime supply of shelter, clothing and tools. But how much do we know about successful gardening? Seed storage? Or foraging for wild plants? The experienced farmer would be our mentor. There are probably places in your own county that would qualify as “wild” enough to pose a problem to you if you weren’t prepared for an unplanned stay-over. In that situation you would not likely succumb to starvation or thirst, but hypothermia could be your nemesis – especially if you were wet. (Even in summer, a cool night can prove deadly.) Hypothermia is the loss of body heat to a point where it cannot be retrieved by a person’s natural metabolism. Without help afforded to the victim (external heat source or hot drink ingested), this condition leads almost certainly to death. Mark Warren owns and directs Medicine Bow Wilderness School, teaching nature classes and Native American survival skills in the mountains of north Georgia. For more information, call: 706-864-5928 or email: medbow@alltel.net or write to: Medicine Bow, 104 Medicine Bow, Dahlonega, GA, 30533. To view the school’s class offerings, please visit the web site at www.medicinebow.net. The gifts of the forest are legion. Today those gifts are thought of as arcane anecdotes to a fast and furious culture disconnected from its environment. Just five centuries ago, the lore of plant foods and medicines and craft materials was the mainstay of the everyday. Every man, woman and child held this knowledge with an intimacy born of pragmatic use and reverence. To create a fire, for example – in the old way, without a match – you must choose your materials with care. Not just any wood will do. You must know that elite tribe of trees that “swallowed fire” in the ancient days, and you must be able to recognize it when it is dead. To make a bow, again only a handful of trees should be considered; and again you must recognize it without its leaves. Bow wood is cut in winter. that can be tapped and drunk without any precautionary preparation. For a survival shelter, a very straight trunk of dead tulip magnolia might look appealing. But familiarity with its brittle grain precludes its use. And, of course, the plant kingdom contains a wealth of foods. But it also has its poisons. Distinguishing one from the other is vital to one’s well-being. Out of default –lacking such plant savvy – many people find their thoughts turned to meat for satisfying hunger in a survival situation. But tracking down, stalking and killing animals is a daunting task for the uninitiated. Animals run away. But not plants. They wait for you. You simply need to know in which habitat to look for a particular species. The Cherokees called the trees “The Standing People.” Their choice of words is profound. “Standing” does not refer only to the upright posture of tree trunks. It reminds that the trees do not move around in the search for food. “People” denotes some kind of sentient capacity for awareness – a primordial feature of all plants discovered by our scientists only in the last few decades. In other words, when you think you are alone in the forest … you’re not. least one that we don’t fully acknowledge – ought to take a front seat in our consciousness. Let me briefly put it to you again in such a way that your entire perspective on life might be forever changed! Physicists of Einstein’s era learned that sunlight contains energy – packets of it. Those packets might as well be encased in blocks of solid steel, for we can’t open them. Only the green plants can. Just a tiny sliver of the sun’s total output touches our planet. But it is enough. That sliver would fall impotent upon the Earth (other than warming it) and for the most part reflect away were it not for the green plants. It is the “green” of plants that absorbs energy. And so plants are our allies in the life-on-Earth equation. They are the middlemen, capturing solar energy so that it is available to every living thing. Where do they store it? In the food they make. We call it sap. So, while all the animals of the forest – fox, deer, snake, etc. – are spending almost all their waking time in the search for food, the green plants are making it. And in the process, with each solar-brewed batch of sap, two by-products are worth mentioning: 1.) A gas is made by the plant. It’s the gas we breathe. 2.) And a gas is absorbed – the one we exhale as a waste. If you are sitting by a window right now, look outside at a tree. If the last three paragraphs sank in, I’m betting that tree is looking a little different to you now. It’s more than pleasing to the eye. It’s crucial, regal, highly specialized, salubrious, beneficent, and very cooperative. Learning the plant kingdom might seem an overwhelming project. It’s true that it takes years of study to begin to feel diversified and confident enough to search out, harvest, prepare and eat wild plants. But some plants are easy to get to know, and we’ll start with one of these. Don’t let the name scare you. The hemlock poison that Socrates drank (and what a horrible death it was) came from an herb, also called “hemlock.” There is nothing toxic about a hemlock tree. In fact, its edible (digestible) parts contain carbohydrates, fats, protein, phosphorous, iron, vitamins A and C, riboflavin, thiamin and niacin. Hemlock is an evergreen. In the East there are two species – one so uncommon that we will concentrate only on the other – Canada hemlock. Hemlock is a true montane tree, growing all through the Blue Ridge both in valleys and high on rock cliff outcrops (generally north-facing). When the tree is found in the piedmont, it is usually in a cool dark cove. and come in two distinct sizes. In addition to the more obvious needle that extends laterally from its branch, a much smaller needle lies flat against, on top of and in line with the branch. It is twisted to show its underside and its two linear white stripes. These stripes are rows of pores for gas exchange during the food-making process and lie on the underside of both types of needles. The miniature cones made by female trees are about the length of the longer needles. Only the fir tree might be confused for a hemlock, because both make short needles that lie in two rows to form a plane. But firs are not common in most of the Blue Ridge. And look closely at the base of a needle. Hemlock needles have a small stalk. Firs don’t. Because hemlocks flourish on the banks of mountain streams, these evergreens play a key role in stream ecology. Any tree growing near a creek or river is drawn to the sunny space over the water; and so it leans, shading the water. Few trees can rival the hemlock as a shade maker – which is one reason the headwaters of streams (in the mountains) are cold. Trees can easily shade a headwaters stream from bank to bank. Cool water contains more oxygen than warmer water, and so this coolness dictates which species of aquatic life can survive. Species of fish and a host of invertebrates might perish if the water were to warm by just a few critical degrees. This might include trout. Here’s a survival tip of immeasurable value: The inner bark of all the native pines of Southern Appalachia is edible. Being one of those pines, hemlock could save your life. Will you like the taste of it? Maybe, maybe not. But it contains critical nutritional value. The inner bark is a thin but compact layer of tubes that lies just beneath the rough outer bark. This is the tree’s circulatory system, delivering a water/nutrient “soup base” to the leaves and then distributing energy-rich food to the roots. Think of the inner bark as a complicated, multi-appendaged sock that fits over the tree’s entire trunk/limb/branch structure. To sample this food, choose a branch that faces south (to discourage possible fungal invasion in the wound) and carefully slice away the rough gray-brown outer bark with the edge of a sharp knife. Beneath this thin “skin” lies the greenish and yellow-white inner bark. Using the point of your knife cut a rectangular incision down through the exposed inner bark into the wood. In spring you can then peel the inner bark up with your fingers. In mid-summer or later you’ll need to coax it up with your blade. Below the inner bark you will reveal the off-white to amber wood, which makes a decided “tap” when you gently strike it with your knifepoint. At first the inner bark is tough. Then it becomes chewy – a little like gum. Finally it breaks down like a food and you’ll know when to swallow it. Long strips can be boiled to make “pine noodles.” Or dry the bark for over a week and grind it into a fine powder by using a mortar and pestle. In this form the bark is hemlock-flour for use in baking. Cherokee men used this flour as an “odor-eater.” Before the hunt, they rubbed it onto their bodies to absorb human scent. Soaking the inner bark also yields a pink dye that can be used on crafts. made from the needles any time of year. Roots are surprisingly tough, and even the small rootlets can be used as cordage without any preparation other than digging them up. The outer bark is rich in tannin – an astringent – and was stripped off a great number of felled trees a century ago to accommodate America’s booming tanning industry. The outermost branchlets of hemlock are probably the tiniest to be found in Appalachia. Some are as thin as thread. Because the tree allows the lower limbs to die (for want of sunlight absorption), this fine branching provides an excellent kindling – but only if the weather has been dry and if the tree is not standing in a humid valley. The dead rough bark can hold enough moisture to foil even a match flame. too resinous to accomplish this. Despite all these practical applications of the hemlock tree, in our time its value lies primarily in what it contributes to the land, to water, and to wildlife. Consider stream water temperature, natural erosion control, and safe evergreen havens for animals during snowstorms. Yet this is a crucial moment in time for our hemlock trees. We are losing them in staggering numbers. To date, most of the damage has been incurred at the northern end of the Appalachians. But the problem has now turned south and reached into Georgia. At the time of this writing, just one mile from my land the hemlocks are dying. I will probably see my hemlocks affected this fall – certainly by next year. The problem is an aphid-like insect accidentally imported from the Orient. It is called the hemlock woolly adelgid. Presently there are three methods being used to save hemlocks: 1.) Chemicals (drenched over roots or injected into soil or trunk), 2.) Soaps and oils (sprayed on all the boughs), and 3.) Biological control (beetles, also from the Orient, reared in a lab and released in the wild). You should consult a professional arborist about applying chemicals and soaps. The former, if applied incorrectly, can devastate streams and wetlands. The latter requires big equipment just to reach all the tree’s limbs. To use beetles, you must have a heavy stand of hemlocks and lots of infestation; otherwise, the beetles are doomed to an early death. In Georgia we now have two laboratories breeding these beetles. One is at Young Harris College (initiated by faculty member Dr. Paul Arnold) and the other at UGA (the result of a massive fundraising drive by a joint effort of environmental groups). Perhaps the most visibly active group in this effort was our county, Lumpkin, in Georgia. To raise funds the Lumpkin Coalition created an annual autumn Hemlockfest – three days of fun, food, education, games, archery, basketry, auctions, old-time skills, knife throwing, and lots of music. Now that the UGA beetle laboratory is up and going, we are excited about a new facility to be built here at North Georgia College & State University in Dahlonega. Whereas the UGA lab supplies beetles only to the U.S. Forest Service, the new lab will service the private sector. Young Harris serves both. Hemlockfest is about hope. We now know that the beetle release program works. We simply have to get more laboratories established to breed these predators. If you would like to play a part in this historic effort to insure that our grandchildren and their grandchildren will know the majestic hemlock tree, come to the festival and join the fun. The earth giveth. And the earth taketh away – especially when it comes to body heat. The cold ground saps a mammal of its precious warmth. When you need to stay overnight in the wild unexpectedly, you need to know how to protect yourself from hypothermia. The materials necessary to accomplish this are abundant, waiting in the forest. So once again, the earth giveth. Humans’ first teachers were the animals; after all, the wild creatures knew all the secrets of staying alive. All Paleo-man had to do was pay attention. From Fox the early hunter learned the trick of placing his feet in a straight line, which eliminated the telltale swagger of lateral movement. From Heron the river stalker took the lesson of the long fishing spear. The barbed stinger of Wasp and the quill of porcupine inspired the flint-knapper to recurve the base of the stone point of his arrowhead. It’s no wonder so many animal tales comprise the mythology of ancient cultures. One of the unsung heroes of woods lore – who seldom gets his due – is Gray Squirrel. Squirrel’s contribution was the lesson of shelter. No culture in history modeled its permanent home on Squirrel’s design, but for an emergency situation in cold weather this life-saving abode still holds an important place in the standard survival skills to know. Many people look up at the clump of dead leaves that Squirrel crams into crotches of tree limbs and assume it is an enlarged version of a bowl-like bird’s nest. It’s not. It is an orb. Three materials are used in the making: leaves, sticks and frayed inner-bark. Leaves serve two purposes: their flat blades shed water if oriented properly and the spaces between the leaves act as insulation pockets to slow down the body’s heat loss. Sticks hold it all in place as an enveloping outer-structure. The frayed bark – usually from tulip tree or basswood in Southern Appalachia – adds more insulation and serves as a mattress. Squirrel burrows an entrance from one side and pushes out a central sleeping chamber. If you duplicated this nest – modifying it only in size – you would become aware of a fundamental difference in sleeping postures between humans and most mammals. They like to curl up – a most efficient retainer of body heat and convenient if your blanket is a furry tail. If you tried sleeping like that, no doubt you would awake in the morning with your cold feet and head sticking out through the walls. (Brrr! About 75% of our body heat is lost through the head and neck.) As a species we don’t tolerate the fetal position for long periods. A linear modification is in order. To begin construction on this emergency shelter – often called the “debris hut” – a sturdy dependable ridgepole is needed. Prop this log on a support and let one end angle to the ground. How high should that prop be? At what point should the prop meet the log? The angle of the ridgepole should roughly parallel an imaginary board laid down on your upper shoulder and hip as you are lying stretched out on one side. The pole should be 8” above the imaginary board. It does not matter how long the log is or where it is propped as long as you have several feet of space between your head and the prop. A pre-existing prop is convenient – a stump, a rock, a fork in a tree – but not so important that you allow it to lure you to a less-than-ideal site. You want a sunny, dry, windless, material-rich site that is safe from accident. Let’s define these requirements. Sunny – Choose open ground, if available, and the south-facing side of any mountainous terrain. Dry – Study the ground for potential water run-off or pooling. Don’t set up where water can invade from below. (The shelter will take care of precipitation.) Avoid low ground where humidity build-up is a nightly occurrence. Windless – Stay below ridge tops or gaps that draw regular winds. Material-rich – Whatever you plan to use as your primary insulation – dead leaves, green leaves, evergreen bows, grass, weeds – be sure your material-hauling distance is reasonable. Safe – Check for hanging limbs or potential deadfalls overhead. Avoid a site below a possible mudslide or avalanche of rock or snow. Survey the ground for animal burrows and major trails. Leave on the A-frame sticks lots of 2”-long branch nubs on the outside of the shelter, none on the inside. Break the A-frame sticks to size so that they do not cross above the ridgepole to form a pocket. Continue these leaning walls of A-frame sticks all the way to the feet-end of the shelter where the ridgepole meets the ground. Now use long thin sticks and sections of vines to create a latticework on the outsides. (This is why the 2” nubs were left on the A-frame sticks.) The latticework has no formula. Add them as horizontal or diagonal pieces and any angle in between. To rainproof your shelter a covering will now be laid over the shelter’s infra-structure. For this write-up, we will use the material most readily found in the Blue Ridge – dead leaves. Scrape up dead leaves where they are most abundant, but never take them from the land immediately uphill from your shelter. Haul these leaves to make a big pile within a few feet of your shelter. “Big” means big. You’ll want about 30 bathtubs-ful. How you place each armful on the shelter is crucial. Don’t cut corners on this part of the technique. Dig one forearm (palm up) under the pile (elbow and forearm on the ground) and firmly pat down the leaves from above at least 10 times with your free forearm until you have a 6”-thick “patty” of dead leaves. Lift this patty carefully, take it to the outside of the A-frame and lay it down on the ground, half of it tilted against the base of the sticks. Lay it at an angle that would carry water away from the center of the shelter. All that patting you did orients a majority of the leaves into one common plane. This is a shingle. After completing the first layer of shingles all the way around the base, start a second layer on top of the first – leaving only the large opening under the letter “A” wall-less. Because of the slant of the A-frame and the tilt of the shingles, this second layer will partially overlap the first, leaving several inches of the lower layer’s topside uncovered – like slanted steps. When the second layer is finished, begin a third. Continue until the walls are 2’ thick … everywhere (except the entrance, of course) … even the apex. To keep the walls in place – Squirrel-style – add a second layer of A-frame sticks, the tighter the better. If you followed these instructions loyally, not one drop of rainwater will find its way into the interior of the shelter. But this shelter will not keep you warm … yet. Note: There is a strong tendency for humans to consider a shelter roof complete at the point that it keeps out light. It isn’t. Be true to the two-foot-thick specification. In very cold weather you’ll want to insulate yourself before you get into your shelter. Any material dry, fine, light, furry, feathery, downy, fibrous or rife with small air pockets might be a good candidate to cram into your clothing. Let comfort be your guide. A few good resources are: softened inner-bark; cattail, thistle or sycamore down; pummeled pine needles; dry, fruticose lichens or fungi; crumpled newspapers; rags, etc. Of that list, the premier clothes-stuffer is cattail down. To install insulation in your shelter, stuff as many leaves as possible into the interior. Finally position one more pile near the entrance and on top of … your door. Without a door, the leaves of that final pile (which you will pull in over your head) will simply disperse and expose your head (the most important part of your body to keep covered). The door will simply lean against this pile to hold it in place. A perfect model for a door would be a triangular section of fencing – say, hog wire or chicken wire. Could you make something like that out of sticks, vines and inner-bark? Try it. You’ll want a section about 3’ by 3’. First … walk away from your shelter and urinate. Then, hopefully, you won’t have to get out during the night. (Each time you leave and re-enter, the insulating leaves inside are more compressed and broken – no longer filling up the inside space. Such a diminished pile is less insulating. Ideally, you would want to refill the shelter with leaves each time you re-enter. For that first entry, auger yourself into the leaves closer to the top than the bottom. You do want leaves above you but you want more between the cold ground and you. When you are almost completely inside, pull in that final pile of leaves after you by grabbing the door and leaning it toward you. 1.) This shelter is plausible only for consecutive night use. Never revisit an old shelter that has been abandoned for any length of time. They make homes for animals with whom you do not want to snuggle up. 2.) Never build a fire near or inside this design. The debris hut is, in fact, very similar to a large well-made pyre. On the list of what to do in an emergency wilderness survival situation, building a fire is often assigned a low priority by survival experts. Here in the Southern Appalachians, two factors have convinced me to change my mind about that. One, the humidity. And two, the lowly chigger. On a late winter trip out West I once found a logging road that recessed into the earth on a steady downhill gradient. It was like a bobsled run with several feet of snow. The road spiraled down a small Colorado mountain for about a mile before leveling out. I had a plan. On the night of the full moon I hiked up the mountain wearing boots, snow pants, a tee shirt, and my trusty stocking cap. In my daypack I carried a fleece-lined windbreaker and a cookie sheet. At the top I donned the jacket, sat down on the cookware and pushed off for one of those grandly memorable escapades of life. That ride was pure bliss. The temperature was just under 20° F.
My point? I stayed comfortable throughout the adventure. The low humidity made that 20° night nothing like a comparable night in Georgia. In the humid South, 20° has a bite. It nips at the skin with a sting. Not only does humidity make cold colder, in the summer it makes the heat hotter. Humidity is one of the defining traits of our homeland. materials and went to work demonstrating the demanding process of spinning a stick in his hands, grinding its end into another stick to create enough friction to ignite a fluffy ball of tinder. He spun and he spun and he spun, but he never made fire. “The humidity of the South has humbled me.” Those were his words. You may be starting to get the picture now. Humidity is a big deal. You have to factor it into your plans to survive an unexpected situation. Fire has many applications: cooking, hardening of weapon points, tempering of stone to be used for weapons, smoking hides for longevity of suppleness, preserving food, purifying water, burning out crafts that include a cavity (canoe, bowl, spoon), defense, drying out things that need drying, nocturnal visibility, insect repellency, preparing medicines, morale-boosting and more. But the all-important gift of fire is its warmth – to fend off hypothermia. Hypothermia is the number one killer of people lost in wilderness. This condition is simply defined as the lowering of the body’s core temperature to a point where it cannot recover without external help. Without that help in the form of another source of heat (a fire, a heater, another warm body, a warm drink), a victim of hypothermia will almost certainly die. pid cool-down of the body due to the evaporation of that sweat could be a critical factor. It can push a body right over the threshold that leads to death. About thirty years ago I began self-imposed annual survival trips just for the adventure of it. In those days it was an inspirational way to sharpen my skills at surviving. It also made me a better teacher of those skills. I reserved a week to disappear and in that week I remained in one place, from which I spiraled out to find my needs. In this way, I built one shelter and used it for the duration. To travel and build a new shelter each night is more work than anyone would want to do. It takes about four hours to construct a good shelter that is rain-proof and cold-proof. That’s four hours in an energetic working mode. No matter how carefully one tries to regulate body heat, by the end of that project a body is covered with sweat. On the first night of such a trip, I exercise without fail what has become a dedicated ritual for me. I build a substantial fire, make sure it is going well with plenty of back-up wood stacked nearby, strip down and hang my clothes to dry by the flames, run to the creek, bathe thoroughly, run back to my fire and dry my body by the flames. Even on a camping trip for pleasure, the last thing I do each night is take that chilly bath – no matter what the season. I sleep better, and I sleep warmer. This practice would not be possible without fire, because the bathing lowers body temperature and could initiate the plunge into hypothermia. to the test, nine out of ten fail. Here’s a test for you to try. This is a worthy task and a chance for quality time with your children, as all of you attempt the one skill that I feel everyone should know. Build a pyre that you can successfully light with one match while the forearm of the lighting hand is flat on the earth. The goal is for the pyre to catch and become so engulfed in flame that a 3” square of newsprint ignites at the height of your knee above the pyre. 1.) Clear a space for safety. Make a bare circle with a radius of 5’ and free of all flammable objects. 2.) At the center of that circle, build a pyre. Be sure to design it so that it can be lighted while your forearm is on the ground. 3.) Sharpen a 4’-long stick on both ends. Stab one end into a little square of newspaper, 3” X 3”. 4.) Impale the stick diagonally into the ground so that the newspaper hovers over the pyre at the height of your knee. 5.) Use one match only. No matter what happens, if you fail with this match, you fail the challenge. 6.) Strike the match; rest your forearm on the ground; light the pyre. 7.) Watch the pyre allow the flame to build … or not. 8.) After the pyre has burned out (whether successful or not), pour water on the char to make sure the sparks are dead. 9.) If you fail, discuss why the pyre failed and what could remedy the problem. Then dismantle the failed pyre and start again. Don’t try to “touch up” a failed pyre. Start over completely. I have found that many children are afraid of matches. That usually means that no one has taken the time to teach them how to safely strike one. When the flame ignites, many children panic … and in the process, burn themselves. Have your child hold an unlighted match out of the wind in a vertical position – matchhead up. Strike your own match and move your flame to the child’s matchhead. When it ignites, talk to the child about the safety of this exercise due to the fact that heat rises. Very rarely have I seen a flame travel down a matchstick. The flame will almost certainly die by itself. Let it. matchhead until the match is vertical. Let it go out. Now for the striking. For safety, strike away from the body, because pieces of a matchhead can fly like tiny meteors. Hold the “cool” end of a match between thumb and long finger with the index applying pressure close to the matchhead. Because this pressure needs to push the matchhead along the scratch strip, the proper position of the hand requires an outward turn of the wrist. Demonstrate how to strike the match and slide the index fingertip out of harm’s way. Have the child practice this maneuver without actually striking the head into a flame. wind blowing? Do flammable materials lie downwind? sawdust in the earth. Though no one knew it at the time, this was the site of an old sawmill.) Is the site a low point where water runs when it rains? Is the space above the fire safe? Do you have water handy nearby to douse a fire? Consider the prevailing wind again. You’ll want to light the pyre from the upwind side. If the wind is strong when it’s time to light the pyre, you can block the wind with your prone body. match flame underneath the very item he hopes to ignite. To achieve this, crisscross small sticks as a shelf an inch or two above the ground. You can accomplish this by several different methods. One is to push four Y-shaped poles into the ground, making a 4” square. Orient the Y’s in the same direction. Connect the crotches of each pair of Y’s with a pencil-sized “rafter”. Span these two rafters with 5 or 6 slightly thinner “cross-rafters”, all parallel. These last comprise the shelf. One of these sticks can be chosen as the champion stick of all kindling. When you lay down you little pile of kindling on the shelf, be sure to let this champion stick protrude down below the shelf like a fuse. It is this fuse you will first ignite with your match. My favorite fuse is carved from a dead pine limb. It’s nothing fancy. Look at what piles up around the feet of any “whittler”. Such a shaving has a natural curl and this allows me to lay it flat on the shelf while the curled end hangs down between two cross-rafters. Bend down and memorize the position of that fuse beneath the shelf. Your tiniest kindling should be a bundle of very thin dead sticks – this bundle being about the size of one-half a baseball. Slightly thicker sticks can be layered over the first bundle, and then pencil-size sticks layered over these. Now you are ready for a conical stacking of poles. The cone-shape is the best design for longevity and heat intensification of a fire. Begin with pencil-thick dead sticks. Lean them over the shelf so that the top end of each pole touches the top of the kindling mound. Place poles all around the pyre except where you plan to insert the match. Once the first layer is complete, start a second layer of poles – these sticks a little thicker than the first. There is no limit as to how thick you graduate. Stack the poles tightly. Once you are up to the log size tipi pole, it is possible to keep a fire going through days of solid rain. altered in the pyre. Let it burn. If the paper ignites on your first try, you are in that elite 10% of the population. If it lights on your second or third try, you deserve even more respect, because you stuck with it. You didn’t give up. Be sure to keep things safe by putting out the fire. Douse it with water. Crunch the wet charcoal with your boots and cover the char with the mud you’ve made. Now, what was this about chiggers? ble – covered in hundreds of maddening welts. Such a malady could be so aggravating as to destroy morale and prevent efficient work. A person could give up in a survival situation. Chiggers don’t bite some people. It has to do with body chemistry and/or diet. I happen to know that my picture is in the wild edible books that all chiggers read. I know about the misery. I would never burrow into leaves during chigger season. Therefore, on a chilly night anytime from June to September, I need a fire … and a shelter that will accommodate a fire. That way I can sleep without a cover contacting my body. I can saturate my clothes and skin with smoke. Beneath my body I can make a mattress of select leaves that repel chiggers. Pawpaw, sassafras, walnut, perilla, juniper. All the while, my fire keeps me warm. Have you ever heard that old adage: watch what the animals eat and you’ll know what to eat, too? Well, forget it. It’s simply not true. The fact is that there was a time when no one had to teach humans what to eat. Take a rat snake. It hatches from an egg deposited by its mother in a safe place. Once it emerges from that rubbery shell, it is unlikely that it will meet it parents in its lifetime. The infant reptile forges ahead into life with a fully-blown, inherited momentum for living, knowing what to eat, how to find it, and how to catch it. Humans were once the same way. the only way I know – is to re-approach it academically. die from eating the wrong plant. I have a friend who once worked as a naturalist for a suburban nature center. In offering a wild edibles class, she took adults into a marsh and gathered the roots of a plant with large arrowhead-shaped leaves. She believed that her class had harvested wapato, Sagittaria latifolia, a delicious tuber when steamed or baked or sautéed. Anyone who has read the journals of Lewis and Clark will be familiar with this native staple. It is mentioned time and time again as an important food all the way into the Northwestern part of the continent. If you undertake the study of wild edibles and wish to supplement your diet with them, you must pay attention to the tiniest characteristics of plants. Hairs, pigments, aromas, vein patterns, leaf arrangements, the shape of teeth along the margin – any one of these traits might be the trait that helps you to positively identify a particular plant. By using a plant book, if you have positively identified wapato (also called “duck potato” or “broad-leaved arrowhead”) in a wetland, roll up your pants and carry a rake down into the water and mud. Use the rake to dig down into the mire as deeply as you can manage and pull up the roots. Churn up the mud thoroughly. The tines will eventually pop off tubers from the ends of the radiating rhizomes (root-like parts) and these tubers will float to the surface of the water. Clean the wapato and cook by any of the methods which you might prepare a potato. One of the plants my students enjoy chewing for the extraction of its apple-flavored sugar is the aptly named “sweetleaf” or “horse sugar.” They learn to fold the leaf carefully so that none of the hairs on the bottom of the leaf can get loose and lodge in the throat. When that happens, a lot of coughing is triggered. It’s those hairs, however, that are the key to identifying the leaf. Without those hairs, the shrub might be confused with azalea or mountain laurel, and here are the symptoms that follow the ingestion of those toxic leaves: headache, extreme thirst, a flood of saliva production, blindness, vertigo, arrhythmia, stomach convulsions, failure of the diaphragm, suffocation, death. This ordeal is spread over about six hours. I suggest you remove sweetleaf from your list of foods to try until you are in the company of a botanist who can guarantee accurate identification. Americans eat so much that the quantity itself is probably what affords a stab at balanced nutrients.) Have you ever finished a dessert after a full meal, sat there at the table feeling absolutely stuffed, but asked for that second slice of pie? Why do we do this? To taste it again. It was the tasting that was the all important satisfying aspect of the eating. A good case in point about unexciting taste is illustrated by pine trees. All the pines of Southern Appalachia contain inner bark that is edible raw, steamed, stripped as noodles and boiled, or dried and powdered into flour for baking. (Pines include hemlock trees, but remember that every evergreen is not necessarily a pine. Yew, for example, is toxic.) This is a most valuable piece of information for two reasons. First, virtually everyone can identify some species of the ubiquitous pine tree; and so this survival food alone should negate the threat of lost people starving to death. And secondly, the nutritional breakdown of pine is impressive. That layer of yellowish inner bark (just beneath the dead layer of outer gray bark) contains protein, fat, phosphorous, iron, carbohydrates, riboflavin, thiamin, niacin, and vitamins A and C. That’s a mouthful. ingredients. Fat is the body’s most efficient energy source and an important requirement in our diet. The right kind of fat, that is. The bad kind of fat runs rampant in our fast food culture and gets so much bad press that the chubby little three-letter word has earned a connotation of ill repute. Protein is so important to the body’s well-being that if it is missing from the diet, the body will break down its on muscle tissue and use that protein. In other words, the body eats itself. It resorts to self-cannibalism. what modern scientists are only now uncovering about a tree’s awareness of what is going on around it. Lay your knife blade flat against the bark and then angle it only slightly, enough to barely cut beneath the thin outer bark layer. When the outer bark has been removed from a surface area equivalent to a three-inch strip of audio cassette tape, with the point of your blade, outline a rectangle by cutting through the inner bark into the wood. Pull up a corner of the rectangle and peel the yellowish inner bark away from the wood, which will be a darker amber color. The small strip you’ve removed is ready to be eaten. Chew it until it goes beyond a chewing gum consistency and breaks apart. At that point you can swallow it. If the plant’s water source is clean, grasp one plant with both hands near its base. In short gentle jerks, pull it upward to free it from the mud. Then peel away the outer leaves one by one until the interior color approaches creamy white. This pale core is a delicacy eaten raw or steamed, and its taste is always a crowd-pleaser. Eat from the bottom toward the upper end of the plant until the tissue becomes too fibrous to chew. If you’re lucky enough to find the cattails in flower, shake the pollen out of the male flower head, which is located just above the female flower head at the top of the tall stalk. The pollen can be eaten out of hand or used as flour in a baking recipe. Both flower heads can be steamed and eaten off their cores like corn on the cob. Gently crack an acorn by using a hefty stone on a log workbench. Peel away the shell and discard it. The two-part split nut inside will usually be covered by a reddish-brown rind, which must be scraped away by a perpendicularly held knife blade. Position the flat (interior) side of nut-half down and slice it into the thinnest flakes possible and collect these in a sauce pan. Pour over this just-boiled water – enough to cover the nuts. When the water turns cloudy brown, pour the water away and repeat until the water remains clear. At this point the acorns are ready to be eaten as is, cooked into gruel, or dried and roasted by a fire, ground into a flour and used for baking. was one-half cup. Native people cleverly solved this problem by removing the green husk and then smashing nut and shell together and soaking in water. Within two days, the shell pieces absorb water and sink while the oil and nut scraps float. This edible portion was skimmed off and used as a soup base called “powcohicora,” a word whose last three syllables should ring a bell. Be safe and sure and selective. Don’t forage in polluted areas, such as the right of way along busy roads. Speaking of roads, if ever the semis stop running on our highways and our grocery stores empty, every bit of information you have gleaned about wild foods will be invaluable. Your botany book might become the most important book in your house. Aside from any gardening you might be doing, forest and field will become your grocery store. Your knowledge about these foods will be in much demand by the people around you. We will have gone full circle in our human history of eating. Once again, the real world – the green one – will be pertinent to everyone. Mark Warren owns and directs Medicine Bow Wilderness School, teaching nature classes and Native American survival skills in the mountains of north Georgia. For more information, call: 706-864-5928 or email: medbow@alltel.net or write to: Medicine Bow, 104 Medicine Bow, Dahlonega, GA, 30533. To view the school’s class offerings, please visit the web site www.medicinebow.net. Can you name the three physical intakes – in their order of immediacy – necessary to keep the human body functioning and alive? In this introductory riddle, I’m not including HEAT; because, depending upon the season, your self-made body heat might suffice, and that gift comes from within. This series of articles has already addressed shelter and fire – the two adjuncts to maintaining body heat. Jumping to the third requirement, we need nourishment through food. This includes all the proteins, fats, carbohydrates, minerals, vitamins and other compounds needed to metabolize for energy and heat, to assemble all the body chemistry and to run all the physiological functions. The average American holds plenty of fuel in supply in the form of fat. Most people, theoretically, could go for weeks without eating. It might not be a pleasant experience, but it is manageable if the mindset is right. article – is much more pressing than food. Every bodily system depends upon the medium of water. Electrical impulses from the brain need it, as do digestion, muscular contraction, enzyme creation, etc. The level of bodily hydration is so important that people who have over-indulged in water intake have died. Twice in my lifetime I have read of misguided college fraternity initiations that forced a new member to drink too much water in too little time. This inundation so dilutes the brain fluids that nerve impulses cannot be sent to the vital organs. In each case, the hazed student died. We will, of course, consider lack of water. If you find yourself in a survival situation – lost or stranded or broken down in a remote area – one of your most important priorities will be to keep yourself hydrated so that you can perform the many tasks that will serve to keep you alive. In the ancient paleo-times of Appalachia this challenge would have been almost as easy as breathing, for the many small streams that flow across our land like the branches of liquid trees provided ready-to-drink refreshment. Inhabitants’ intestines would have adjusted to the local microorganisms living in these creeks. could hit you like a sledgehammer. No matter how clean a headwater stream or spring might appear, the naked eye cannot make an accurate appraisal of water purity. Nor can the tongue in the test of taste. The state of our streams is one of the hallmark deteriorations of our time. 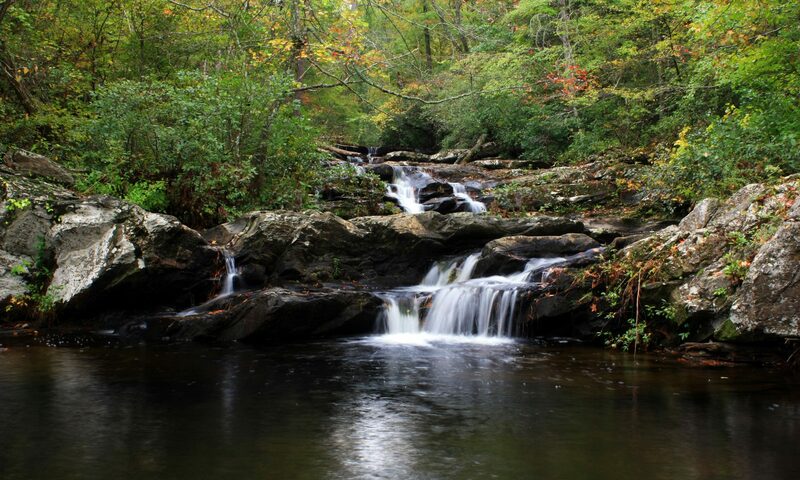 I believe that, if it were possible for the early Cherokees to return here from the past, of all the mind-boggling changes on their land that they would have to digest, the most heart-breaking of all would be the state of our urban streams. 1.) Population explosion. Rivers do possess self-cleansing mechanisms, but they cannot keep up with the human volume of impact dumped onto them. (Did you know that all of our municipal sewage is not treated? We ask the rivers to finish the work for us! ) Consider the industrial wastes that follow the evolution of our technology. 2.) Disconnection from nature. Because most people no longer have daily tangible contact with natural streams, no real relationship is formed between humans and the very streams that supply their homes. Human nature must also be accountable in this equation. Along with this disconnection goes greed, fear, lack of education and the temptation to cut corners blindly at the expense of the environment. If you have not seen the movie, A Civil Action, have a look. in those streams. We knew them intimately. today’s children relate to nature from their experiences with video games. To them, the game is the familiar reality. The river is alien territory, rife with discomforts and perils and the unknown. This matter ofIntimacy Lost should be a prime concern to all parents and to world citizens as a whole. The remedy? Go outside with your children and explore. Consider a 14th century Cherokee woman, who daily walked to a creek for water. She knelt, scooped water with a cupped hand, and drank before filling her clay pot for home use. Such an act might be considered a ritual. Certainly the morning bodily immersion was. What an intimate connection this ablution was. Each day began with it. Today morning showers generally serve two very different purposes. I’ve done informal surveys on it in my adult and children’s classes. 1.) To wake up after insufficient hours of sleep. 2.) To prevent a “bad-hair day.” The hot water flows in a seemingly endless and God-given right. During the shower, I would venture to say that virtually no child and few adults connect that generous supply to a water heater that relies on non-renewable resources and to the ground water or surface water that supplies the shower. On the other hand, there are people who heat with solar panels (and even some who don’t) who are acutely aware of their systems. I know of two people who turn off water when suds-ing up. Would that Cherokee woman ever spit or throw dirt or urinate into her creek? Certainly not. Just as you would not befoul the water jug in your refrigerator. The Cherokee believed that to put body wastes in water invoked the fish spirit, which entered the body and made one sick. In an indirect way, doesn’t this myth hold truth? it, even though they live with such a connection. In a survival situation the value of clean water is quickly elevated to its former historical status as a priceless commodity. Without clean water to drink, dehydration leads to headache, fatigue and eventually death. And the more you wander in search of it or expend energy in other projects such as shelter and fire, the faster you lose what water you do have stored in your body. Clean water does exist inside select plants. Hickories, maples and sycamores can be tapped for drinkable sap. It’s done exactly as New Englanders tap into the sugar maple in the syrup business. You need a drilling tool. A knife works fine. In a pinch a properly edged stone will do. Cut a ½ inch diameter hole 1 to 2 inches into several sides of the same tree. Make the entry cut at an upward slant, insert a stout hollow tube as a spigot. Plants such as Joe Pye Weed, river cane, and some sunflowers can supply these conduits. A container must be hung from the notched tube or set on top of a log propped against the trunk to collect the potable sap that leaks out. Grape vines are a wonderful source of water from spring through fall. Sever a large climbing vine near the ground and place a container under it. At this point water struggles to drip out of the porous vine. To “open the valve,” climb the supporting tree as high as you can and cut a canoe-shaped notch from the side of the vine. The result is like taking your finger off the top of a filled drinking straw. The water (sap) drips at a good rate. Often I lie beneath the vine and collect a mouthful in a minute. The most reliable method of obtaining quantities of drinking water is to boil creek water for 15-20 minutes. But how can you do this with- out cookware? If you can build a fire and burn some hardwood, the coals produced can be used to burn out a concave bowl from a chunk of dead wood. Even a downed log would suffice. How do you boil water in a wooden bowl? Using sticks or a bark scoop or hand-fashioned tongs, transfer a coal to your log and hold it down on the top of the log with a green stick. Blow on it with a 6 inch section of one of the hollow tubes mentioned above. The process begins slowly, and you’ll need more coals to replace burned out ones. But eventually a depression is burned out and then the bowl itself becomes the coal. Keep super-heating that coal, adding new coals when needed, and the cavity grows at a faster rate. If the bowl starts to migrate toward an edge of the log, paste mud over that side to arrest the progress in that direction. When the bowl can hold several cups or a gallon of water, you have a serviceable container for boiling. Clean out the charred wood with sand and a smooth river stone. Then transfer water to the bowl by whatever means possible – a hat, cupped hands, a sopping bandana to be wrung out, a sun-bleached box turtle shell, etc. Have you anticipated how to boil this water? While you are burning out your bowl, place into the coals of the fire hard a dozen smooth hard (not crumbly) stones smaller than a ping pong ball. Carry these red hot stones (the same way you carried your coals) to your bowl and immerse them as needed to achieve boiling and keep the water boiling for 20 minutes. Rain of course, brings plentiful supplies of water. You’ll need “half-pipe” conduits of stripped tree bark from tulip trees, hickory, willow, poplar or basswood to set up a sloped sunburst of “spokes” that guide water to the bowl. If you have a sheet of plastic or poncho, tie the corners loosely to trees and your funnels and container are one in the same piece. Can you drink urine? Is this a myth? There are arguments for and against this sometimes unappealing form of hydration. To most survival victims, this might seem a last resort to replenish body fluids. But to practice this as a last resort would be ill advised. According to URAC (Utilization Review Accreditation Commission) drinking urine at the beginning of a survival situation is safe. The primary constituent of urine is water, next comes urea, which has some positive properties such as antibacterial, antifungal and antiviral characteristics. one drinks urine over a period of time, the higher grows the ratio of impurities to water, because those impurities are returned to the body to be filtered out again. For people taking certain drugs (legal and illegal) and people exposed to occupational environmental hazards, drinking urine is not advised. Normally my teaching does not extend beyond those skills practiced by the Cherokee, but it is worth mentioning a few other water cleansing systems. One is a time-consuming method called the solar still. Dig a 3’ X 3’ X 3’ pit in the earth in an open sunny area. Throw in torn green plants and place a container at the bottom center of the pit. Loosely cover the pit with a sheet of plastic anchored by rocks on the sides and position one rock on top of the plastic at center, directly over the container. Water from the earth and the added plants evaporates and condenses on the lower side of the plastic. The inverted cone shape of the plastic (due to the center rock) allows gravity to take the adhering droplets downslope, where they collect and cohere to one another. The amassing weight breaks their adhesion to the plastic and big drops drip into the container. By inserting a hollow tube (Joe Pye Weed) from one side of the plastic, you can draw clean water from the container up to the mouth. Otherwise you’ll need to dismantle the solar still to access the water. Another primitive method of water purification promoted by some survivalists is a three-tiered filter of grass, sand and charcoal from your campfire. This structure requires the making of a small tripod and three pieces of cloth tied like a high rise of hammocks to hold each tier of filter material. First, the water is allowed to settle out any silt and other solids overnight in a container. Next day, the water is carefully poured (sans sediment at the bottom) over the top tier of grass, through which it trickles down through the sand level and seeps to the charcoal level and finally drips into another container. Though good results have been achieved with this system, I believe it isn’t fail-proof for people who have regularly relied on municipally cleaned water. Technology has afforded wilderness wanderers some other light-weight, time-saving tools. Pump filters can take stream water and convert it immediately into potable water. It’s a matter of submerging a hose and pumping through a filter into a container. And filter-straws are available. With these you can sip directly from the stream. After a certain number of gallons of use, a straw should be replaced. Though people do often get away with drinking directly from springs, the price one pays for ingesting “bad” water is severe. The sickness can be debilitating. Nausea and cramps begin. Then dysentery leads to further dehydration. Together these symptoms can keep you from performing simple tasks within an hour after ingesting bad water. Over time, unchecked dysentery can lead to death by dehydration. But nature has its wonder cure. A single cup of sassafras root tea can destroy the harmful microorganisms and have you back on your feet within another hour. This works for spoiled foods as well. in size to a ¾” length of a #2 pencil. Score it with your knife and steep it in just-boiled water until the water is well-tinged in pink-red. Drink up. Sassafras is a native word meaning “green twig.” This color of new bark is just one identifying characteristic of the tree. But other trees have such colorful new growth also, like sourwood and high-bush blueberry and sweet gum. If you don’t know sassafras, make it a priority to learn how to identify it in any season. Its uniquely varying leaf shapes (3 of them – a football, a mitten, and Casper the Friendly Ghost) are easy to learn. But beware: another tree also makes these leaf shapes and this one – mulberry – should not be made into a tea. Its sap is toxic Differentiating between the two is easy. Sassafras leaves have smooth margins. Mulberry leaves are serrate. Sassafras bark shows a cinnamon color when the outer flake of bark is scratched away. Older trees show diamond-shaped ridges on the bark. But most important is the scent of the root or rhizome. It has a distinct root beer aroma. breaks down from UV exposure? You’ll want to know the ancient ways, because the resources of the forest never run out. You’ll always have streams and wood and hollow stems and vines and rocks and herbs and all the other gifts that nature supplies without a single degree of management on the part of humans. You know … that same nature that worked just fine before we made our entrance upon the historical stage? And once again, the ability to create fire from scratch becomes a treasured skill. Mark Warren owns and directs Medicine Bow Wilderness School, teaching nature classes and Native American survival skills in the mountains of north Georgia. Mark travels to provide classes in your vicinity. For more information, call: 706-864-5928 or email: medbow@alltel.net or write to: Medicine Bow, 104 Medicine Bow, Dahlonega, GA, 30533. To view the school’s class offerings, please visit the web site www.medicinebow.net.